Today is the feast of a pair of sisters from a well-to-do family in northern Syria: Sts. Marana and Cyra. They lived their lives in strict asceticism during the fourth century outside the city of Berea. The main hagiographical source for the sisters is a book by Theodoret of Cyrus where he records the lives of several monastics in and around his diocese. He visited Sts. Marana and Cyra several times, so his account is a personal one. The book is actually quite fascinating, because the style of monasticism that existed in Syria, particularly in the north, seems quite alien to the more familiar cenobitic communities that we in the West normally associate with Christian monasticism. The communities in Syria were eremitic in nature; however, they formed on the outskirts of cities and seemingly interacted with people from those cities. In the case of Sts. Marana and Cyra, the lived in an enclosure with no roof. The door was walled up with clay, save for a small hole through which people could talk to the sisters and deliver them food on the rare occasion they actually ate. There was also another building in which maidservants and other followers stayed. These the sisters encouraged in their spiritual pursuits. Theodoret notes that normally the sisters only talked to outsiders during the season of Pentecost; however, being a bishop, Sts. Marana and Cyra actually removed their wall so that Theodoret could minister to them in person. He made several visits trying to convince them to remove the heavy chains that they wore as part of their ascetic practice. The sisters would oblige him while he was in their presence and then put them back on when he was away. They lived this way, according to Theodoret, for forty-two years only stopping when they went on a pair of pilgrimages to Jerusalem and the shrine of St. Tecla in Isauria. Inside are monks chained to the walls. The key to these chains is on their person, so they voluntarily choose to live in this state. People from the city bring simple food offerings to the monks in exchange for prayers. Some even will have advice to give or possibly even religious conversations, but only during certain season of the year. For the rest, they pray in silence. These monks, of course, could be a really entraining patron for PCs. Not only would the encounters be strange, but the players would have to learn the idiosyncrasies of their patron in order to be able to learn when he/she is willing to talk. They might even unexpectedly find the cell empty when the monk (unannounced) goes on a pilgrimage. Indeed, once the players get used to the strangeness, there could be an entire adventure built around the disappearance of all of the monks outside their home base. One day the monks are all there, the next they are just gone. What follows is the version of the Thief that I would want to play, and therefore is the one I offer as a PC class in my LL games. It was made using a combination of concepts from Starships and Spacemen 2e by Goblinoid Games and the custom character creation system from the ACKS Players Companion. If Fighter 1 from the ACKS PC is collapsed (as suggested by Harvicus) so that both Broad and Narrow weapon selection = d6 class damage die, this version of the thief gains two extra slots by reducing armor from Unrestricted to Narrow (Leather only). They then have the fighting styles of two weapons and TH weapons (weapon + shield is the one unavailable). It would be possible to gain one more slot (and thus one more Thief ability) by sacrificing the ability to use TH weapons. Arcane Dabbling: The character may attempt to use wands, staffs, and other magic items only useable by magic users. A successful throw is necessary. Failure (at the discretion of the Referee) may result in unexpected results. Climb Walls: This is an ability to climb sheer surfaces and the like which could otherwise only be scaled with proper equipment. Find Traps: This allows the Thief to detect a trap. This ability roll is in addition to any other roll that might be applicable (if a normal character can spot a trap with a 1-2 on a d6, the Thief gets that roll in addition to the Find Traps ability). Hear Noise: This allows the Thief to hear noises not otherwise detectable. It also allows the Thief an additional opportunity to hear a noise normally detectable by other classes. Hide in Shadows: This allows the Thief an additional opportunity to achieve surprise in situations where hiding could achieve such an effect. At the discretion of the Referee, it may also afford opportunities at surprise when not possible by other classes. Move Silently: This allows the Thief an additional opportunity to achieve surprise in situations where moving quietly could achieve such an effect. At the discretion of the Referee, it may also afford opportunities at surprise when not possible by other classes. Open Locks: This allows the Thief an opportunity to open a door without alerting those on the other side of the door. It also represents an ability to unlock a variety of items (like a chest) without bringing harm to that item. Read Languages: This ability allows the Thief an ability to understand a piece of writing in any language. Once a Thief fails, he cannot try again on the same writing (unless he finds relevant information that would merit another try). Sleight of Hand: This is the ability to do a practical effect with the hands that is akin to magic tricks. In other words, these are things that normally would not seem possible, but are made possible through deft hands. In lieu of one of the seven, a player may substitute Backstab, which is a special attack when the Thief achieves surprise (either normally or through Hide in Shadows or Move Silently). When backstabbing, the thief receives an attack bonus of +4. At 1st through 4th levels a successful attack does double the normal damage, at 5th-8th levels triple the normal damage, at 9th-12th levels quadruple the normal damage, and at 13th level or higher quintuple the normal damage. The player then picks a primary specialization and a secondary specialization. See the table below for the different chances of success for primary and secondary specialization in comparison to other abilities. Due to the need to move freely to use their abilities, Thieves may only wear leather armor or lighter and may not use shields. They may; however, fight with a weapon in each hand or with TH weapons. Reaching 9th Level: At level 9, a Thief can establish a hideout, and 2d6 thief apprentices of 1st level will come to work with the character. A successful character may use these followers to start a Thieves’ Guild. I have to be honest, I don’t normally do villains when I prepare any kind of campaign, especially a sandbox. The best villains are those that players love to hate and I am almost always surprised by what players end up hating. In my experience, it almost never is the person I want them to. Therefore, my job isn’t to provide them with my villain, but rather offer enough opportunities for the players to find out who they really want to have as their villain. The first time I learned this lesson was a Champions campaign back when I was in high school. The initial sessions took place in a prison for supers where all the PCs were interred. They didn’t remember how they got there or why. Eventually, the prison was attacked by aliens, which offered the PCs an opportunity to escape. The big reveal was that the prison was actually in orbit and was just an initial phase of the alien invasion. Thus, I had two big villains that I was planning to use: the guys who funded the prison and the leader of the aliens. Who did the players end up hating? Some throw-away fellow inmate who successfully fought off the PCs in order to get to a life boat, which the PCs were trying to hold onto for themselves. I realized that I had to make a major concession to the players by making this throw away NPC into a major villain when I heard my friends making plans on how they were going to track this guy down. Alien invasions and a group imprisoning supers in space had to wait. The campaign turned out to be a blast because they had a villain they chose. Even if players do end up loving to hate one of the villains I want them to, they usually end up finding a way to legitimately get rid of them long before I want them to. Having said that, I do have an idea brewing about the Old One that has too much goodness not to include in my Blackmarsh campaign thought experiment. I was leafing through Matt Finch’s Tome of Adventure Design when I came upon an entry in his section for inspiring Undead monsters. One of the ways he suggests an intelligent undead creature became undead was by placing living body parts into a corpse to keep it “alive.” Couple this with the idea that said undead creature had a contagious form of undeath and my creative juices starting mulling over a way to have the Old One an active villain in the campaign. The form of undeath the Old One concocted for himself involved a further refinement of the magic found in the Subterranean Lake of Watery Simulacrums. His goal was to create multiples of himself, all while sharing a kind of hive mind. He found a way to infect his own flesh so that if he injects a corpse with his blood (or any other part of his flesh) that corpse will animate as an extention of his awareness and mind. These magics did not work entirely as planned, however. The more corpses the Old One occupies, the less powerful each possessed corpse is. At the moment, I am thinking that each additional corpse would approximately half his HD and spell casting abilities. Thus, if the Old One were understood to be a 14HD monster, for example, he could have two corpses in his hive mind at 7HD each or up to twenty-eight corpses at 1/2 HD. 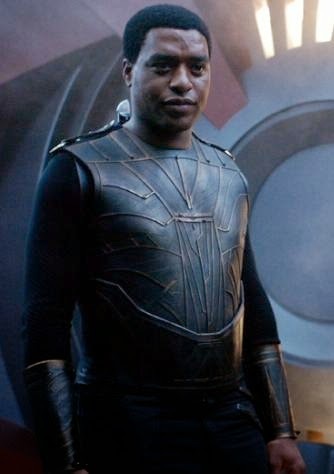 This would make him a villain that not only would be really difficult to kill off, but one that could engage the party at several different power levels. To boot, he will probably know a lot more about the PCs than they ever expect him to. The thing that I find really attractive about this particular set-up, though, is that I have the option of making whoever it is that the players end up making their villain one of the corpses the Old One has added to his hive mind. After my brief foray into looking at the Basic Rules for 5e (which led to the unfortunate conclusion that it's unplayable as-is), I have shifted my focus back to my own RPG comfort zone — some iteration of B/X (and my favorite B/X retro-clone, Labyrinth Lord). Since I do not have the luxury of playing at the moment, and the only way I can decide whether or not hacking 5e is worth my while is by playing it, I am simply going to go back to hacking the version of the game I know I love to play. To that end, I would like to highlight the one RPG-related purchase that I have spent more time using in the last year than any other — the ACKS Players Companion (ACKS PC). As with all things B/X, the guys at Autarch reverse engineered all of the core classes (minus the halfling) and then came up with a system with which to create all kinds of classes, including those same core classes. It is rather ingenious, actually, because it is now possible to create campaign-specific classes for a B/X-type of game. This is important for me, because when I started my Lost Colonies campaign, I only allowed Fighters, Clerics, Magic-Users, Dwarves and Elves. As the campaign evolved, not only did players want to explore different class options, but the campaign world itself demanded it. At the time, however, I didn’t have a lot of options for dealing with these needs other than introduce Advanced Edition classes, which didn’t quite fit. With the ACKS PC, I am now able to create those classes exactly the way I want to and still have them express some kind of balance according to the logic of the B/X core classes. There is only one issue with the whole system that I am struggling with: weapon damage. ACKS elegantly divides weapons into various categories where each has a one-handed, one-and-a-half handed and two-handed version. These do from 1d6 to 1d10 damage. This isn’t an issue if the world can logically supply all these types of weapons; however, Lost Colonies is a metal-poor setting where iron, especially, is quite rare. Swords are normally bronze and there is no such thing as a long or two-handed bronze sword. This throws a kink into the ACKS damage system. To boot, I also normally use universal d6 damage at my table for a variety of reasons; however, using weapon selection is a key element to the custom class design presented in the ACKS PC. Therefore, I need to somehow make weapon choice or damage meaningful in order to properly implement the custom class system. This would be a simple solution save for a couple of concerns. I wonder if d10 damage too powerful? Elves and Dwarves would also do d10 via this system and, in the case of elves I do think that is too much. The first would be to dial back all the damage by one die, where Unrestricted is d8 and Restricted is d3. That poses the question of whether or not the magic-user and cleric are too weak. The second option is to use the ACKS PC system to hack the fighter, elf and dwarf to have Broad d8 damage with some kind of weapon specialization/combat bonus; however this would add to the XP total necessary to advance. Fighters would need 2150 XP, elves 4150 and dwarves 2350. It doesn’t seem like much, but especially with elves it certainly feels that way. The third option is to use Unrestricted = d10, etc. for human characters and Unrestricted = d8, etc. for demi-humans. So, my question (especially to those of you who have used class-based damage) which of these options do you like best? One thing to keep in mind about sandbox campaigns is that the world does not remain static. It must react to the actions (or inaction) of the PCs. This is where the Centerpiece Dungeon really becomes useful. As information about its contents spreads far and wide, the various factions of the campaign world will take interest and begin to act. Your job is to figure out who, when and what you’ll have the most fun with. Note: I like to call this stuff Background Noise, because it may be as simple as letting the players know that there seems to be a larger population of Dwarves at Blackoak Castle, or that the elves seem to be a bit less friendly or that there is a strangely dressed man at the tavern these days. The world is moving, but the players need not act on any of it. Its just background noise until they decide that they need to find out more about the dwarves, the elves or the guy in the tavern. All of this leads to more information and more choices. Remember, every choice the players make has a consequence. If they ignore the Centerpiece Dungeon long enough, factions are going to be able to mount successful expeditions and bring out artifacts that will then be used to further their agenda. In Fedor’s Pass, there are three Jade Images that have been broken. Each is missing one or more pieces that may or may not be found within Fedor’s Pass. These pieces must be restored in order to get one of three keys that will open doors to the lowest level of Fedor’s Pass, The Tomb of the Old One which is going to have a Tomb of Horrors kinda feel to it. Thus, part of the background noise is going to be these jade pieces. Where are they and who has them? Another is going to be the actions of Scytheback. He can polymorph into a human with one eye. Given his powers as an ancient dragon this will allow him to pose as an Odin-type figure and influence both the Osrobards and the Vasan Vikings (and through them, possibly the PCs). His interest will be making sure the Old One is dead and gone so that he no longer has to operate in secret. This is probably the most important aspect of a good sandbox campaign, because a sandbox only really works when players can make informed decisions about what they want their characters to do. Thus, I tend to disagree with the way rumor tables are traditionally done — with both true and false rumors. I don’t mind partially true entries, but false rumors have no real pay-off in terms of player choice and the consequences of those choices. Whereas a partially true rumor can be discovered to be inaccurate, a false rumor usually just gets forgotten. Blackoak Castle, therefore, serves as an excellent home base for an adventuring party. Not only is it in close proximity to Fedor’s Pass, but it is also a font of information as rangers come in from all over Blackmarsh with stories (mostly accurate) of new threats to peace. In addition, the PCs can become members of the Blackoak Rangers which will avail them of even more accurate information. Thus, players will never be short of choice when it comes to what their characters do next. Note: I am not adverse to using published adventures for locals outside of the Centerpiece Dungeon. Thus, if your library has good stand-ins for Daur Anthar and a wizard’s tower, I’d happily use them with one caveat: drop clues about the Old One in these published adventures. It can be as simple as a treasure map or a book of ancient history. This will keep feeding the players information about the Centerpiece Dungeon (Fedor’s Pass), helping them make informed decisions about how to react to the things the campaign world is doing in context of the Centerpiece Dungeon. Today is the Feast of St. Timothy of Symbola, who was of Italian descent. He was attracted to the monastic life and was tonsured at a young age. After spending years of training in a monastery he received the gift to heal the sick and to cast out unclean spirits. He also spent many years as a hermit, wandering the wilderness offering up prayer both day and night. He died at what is only called “a great old age” in the year A.D. 795. This date places him in the era of iconoclasm, an era when many monastics came into direct conflict with emperors over the use of icons in the Church. Indeed, St. Timothy may very well have taken to the hermetic life because of imperial pressure upon the monasteries. St. Timothy gets his title “of Symbola” because he pursued his asceticism at a monastery called “Symbola.” This monastery was near Mount Olympus; however, if you think this means he lived his life in northern Greece, you would be mistaken, because the Symbola Monastery was in Asia Minor, near the Sea of Mamara on the southern edge of Bithynia. Yes, I did talk about these two places last week. 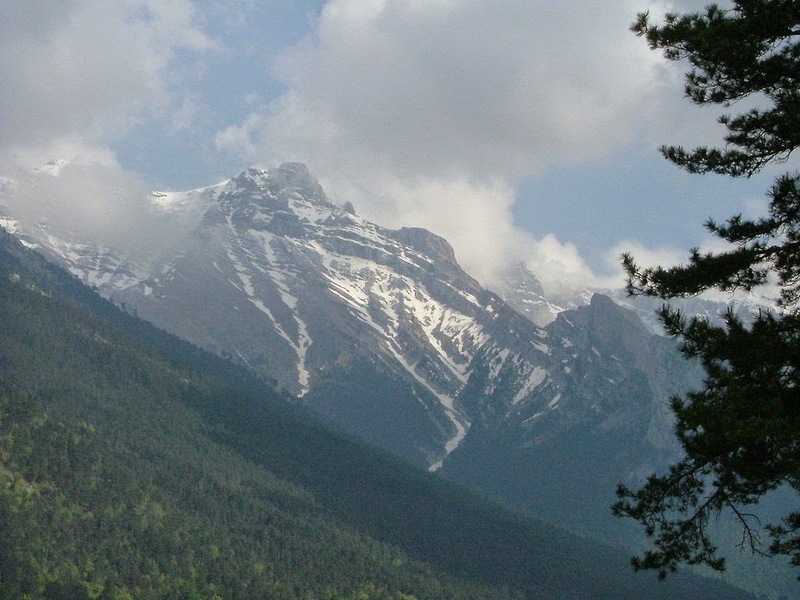 Although today it is called Uludağ or Keşiş Dağı (literally “Mountain of Monks”), this mountain was called Olympus in antiquity. It is not alone. In addition to the world-famous Mt. Olympus where the pagan Greeks imagined their gods lived, there are another five in Greece (at Lesbos, Euboea, East Attics, Skyros and Arcadia). Besides the “Mountain of Monks," there are three more in Turkey (at Bartin, Kemer and Aegean Turkey). Finally, the highest point in Cyprus is another Mt. Olympus. Firstly, I’d further develop the campaign of the Sea of Mamara with a brewing conflict between a group of rebellious monks (based out of the Mountain of Monks) and one of the political powers in the area. This is not something isolated to this campaign or this particular era, either. Monastics of all stripes have come into conflict with political powers throughout history. The key is finding an issue intriguing enough to add a bit of fun to the campaign. Secondly, the fact that there are eleven (!) mountains by the name of Olympus in the ancient world, reminds me of the value of having multiple names for various landmarks in a campaign, with some of those names referring to multiple places. This is especially true in a campaign where the PCs are interested in finding an artifact, a tomb, a person, etc. that is located at a “Mt. Olympus.” The players are then left with trying to decipher which is the “Mt. Olypmus” in question. Over the years, various bloggers (which ones I cannot recall at the moment), have posited using The Lost Caverns of Tsojcanth or The Tomb of Horrors as goals for PCs introduced at the beginning of the campaign. Should players choose, the whole campaign could focus on getting information detailing the contents of these dungeons so that when they were ready, the players would have a fighting chance of success (especially in the case of the The Tomb of Horrors). This campaign would be especially interesting should the PCs not be the only ones interested in finding and conquering the dungeon. In such a campaign, having several different versions of “Mt. Olympus” with multiple names would add a layer of complexity, forcing characters to choose which to focus on, or possibly use to mislead rival parties. 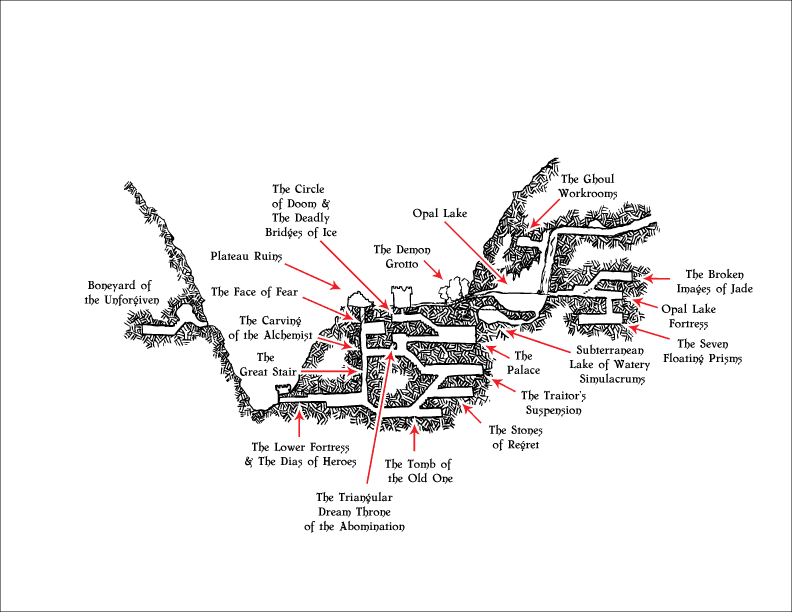 It is now time to use the level names and landmarks of the dungeon to inspire several different eras of occupation. I normally use three, because that gives me enough detail to keep things interesting while being simple enough to make the design work easier. I tend to label these eras Ancient, Old and Present. The most evocative name level of the dungeon seems to me to be The Tomb of the Old One. This is where the McGuffin of the campaign is going to be and where all of the various factions are going to want access to. It is therefore imperative that I know who the Old One really is. According to the original material, Scytheback was part of the reason the Bright Empire fell; however, remnants of the Empire still hold on. Thus, the dragon had to have been stopped at some point. This is where the Old One enters into the picture. The Old One was (is?) a powerful magic-user from the days of the Bright Empire. Today, no one remembers his (her?) name. Tasked with stopping the dragon Scytheback, they entered into battle. The dragon nearly lost its life and did lose an eye. Never before had the beast encountered such a powerful adversary. Never before had it experienced fear. It has laid low ever since, using intermediaries to do its will. Little did the dragon know that the Old One was also crippled in the fight. Unable to survive another onslaught by the dragon, the Old One turned to dark secrets in order to protect the people of the Bright Empire. As an accomplished necromancer, the Old One became corrupt. In the end, the Old One did more to bring down the Empire than did Scytheback. Today no one knows if the Old One lives or has died, but artifacts occasionally do show up, reminding the people of Blackmarsh that a powerful mage once roamed these lands. The fortification on the surface of the dungeon was built later without knowledge of the lower sections beneath. 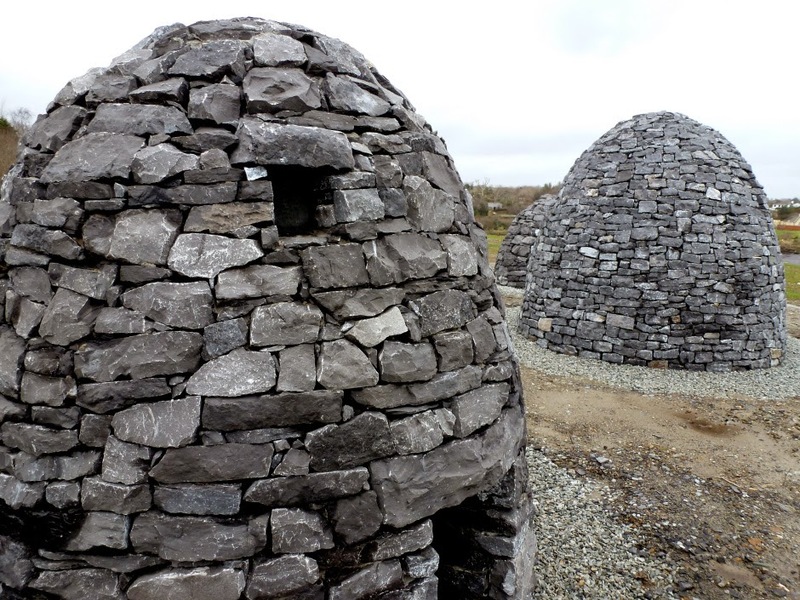 The stone giants of the White Mountains suggest a reason why the fortifications became necessary. Off the west side of the map is giant territory. The pass was a means for those giants to raid Blackmarsh. This period was colloquially called the Giants Wars. Eventually, things escalated when the various types of giants were united by a frost giant named Gymir. Due to the disorganization of the giants, the fortification of Fedor’s Pass proved to be partially effective. Once united, however, Fedor’s Pass quickly fell and the people of Blackmarsh got desperate. Gathering a large amount of viz, a group of mages cast a ritual spell that closed off the mountain pass. The remaining giants were either hunted down and killed or agreed to some form of peace. The stone giants are all that remain of those stranded in Blackmarsh by the Giant Wars. The fortress at Fedor’s Pass was briefly maintained after the Giant Wars; however, the post was plagued by bad luck, accidents and a few unnatural deaths. Given that it no longer had any real protective purpose the post was eventually abandoned. It is now time to take elements of the Ancient and Old eras of the dungeon and weave them into who presently occupies the dungeon. Currently, the main fort of Fedor’s Pass is occupied by a force of goblins led by the bugbear Drefec. They are a part of a coalition of goblin tribes led by the stone giant Lythor. Unlike many of the stone giants currently in the region, he is Chaotic and yearns for the days of old when the giants were terrorizing the land during the Giant Wars. Fueling this desire was a chance discovery of a volume that once belonged to the Old One. Lythor read the book and his already cruel intelligence became dangerously high. Subsequently, he has organized the local goblin tribes into a personal army. At the beginning of the campaign, Lythor has been sending out scouting parties in search of clues for the resting place of the Old One because there are references in the tome he read of other books, weapons and treasures that could turn his private army into a conquering hoard. The bugbear Drefec has unknowingly found the location of the Tomb of the Old One; however, he has discovered an artifact of the Old One himself and is now only paying lip service to Lythor. Beneath the Opal Lake is an artifact manufactured by the Old One call the Subterranean Lake of Watery Simulacrums. Drefec now lies within that artifact and is able to send individual duplicates of himself to rule and fight without fear of death, because when one simulacrum is destroyed (turning into water), another one can rise with all the knowledge of the previous Simulacrum. It is now time to name each level of the centerpiece dungeon and place landmarks throughout. The goal here is to have each area of the dungeon have a specific function and feel that differentiates it from everything else. The reason to do this is to not only make the dungeon itself better, but to start to knit together a background story that will serve the campaign. By the way, do yourself a favor and check out Matt Finch’s Tome of Adventure Design. It is filled with random table goodness for coming up with dungeon level landmarks and names. It is one of the single best RPG purchases I have ever made. This is an important step, even if you never see your players show any desire for entering your megadungeon/dungeon of choice. The reason being, the backstory of the dungeon affects the backstory of the region and the campaign. Often times, there will be something inside the dungeon, whether an object, a person or a piece of information (or all three) that the various factions within the campaign are vying for. Thus, the dungeon will be a source of adventure even if the players themselves never go there. Go to Dave’s Mapper and play. You can make a side-view of a dungeon and then a map for each section of the dungeon in that side view. You can also go look at the plethora of maps Dyson Logos has done over the years. To keep your own efforts to a minimum, you really need only do a sideview to begin. The rest can be done later as needed. For my own purposes, I decided to go with a map Dyson drew several years ago called Fedor’s Pass. The name is evocative, there are a number of levels already mapped and some that are not. This leaves room for me to use either maps of my own creation, those found by playing with Dave’s Mapper or using other maps by Dyson. The name “Fedor’s Pass” suggests that the surface structure was used to protect a road that wound its way from one side of a mountain range to another. Blackmarsh has several mountain ranges: The White Mountains, The Pendar Mountains, and the Dragonbone Peaks. The latter is the most tempting, due to its massive cave network; however, the only place that might have a pass leads to a forest…with pixies. The Pendar and White Mountains occupy the western edge of the map. If the whole 010X column of hexes were filled in with mountains and hills, then there would be a need for a pass to go west off the map. Hex 0107 has a group of bandits out for revenge against Castle Blackoak, something I am not particularly interested in. It would, however, put Fendar’s Pass in close proximity to the castle and make sense as front-line defense position for anything trying to use the path to raid or invade Blackmarsh. Seriously. Your job is not to follow the whims or will of the author. Your job is to create a world that you have fun with. This is one of the reasons I prefer products like Blachmarsh and the Wilderlands. The terseness used by the authors gives me permission to use, ignore or change anything I want. There is no canon I have to break. There is no intricate back story I have to re-craft. The implied effort of the author is only invested in a few sentences at most. Thus, I am not going to hurt any one’s feelings (or be challenged by a canon-nazi). Indeed, I would imagine that Rob would be thrilled at seeing me take his Blackmarsh setting and run with it in whatever direction I want to take it. He did exactly the same thing with the Wilderlands, after all. I also know from personal experience that once a campaign begins, I very rarely have to re-read or even look at the published campaign material. Everything that happens is driven by character action (or inaction). I use the stuff I care about and let them react to what PCs are doing. The results are almost always fun for me because the campaign is no longer the published material, it’s mine. As written, Scytheback is a very old red dragon. I want an ancient black dragon who knows how to polymorph self. (Red dragons bore me, acid breath is terrifying and polymorphing dragons are awesome NPCs). I want to change the name of the Blackmarsh Rangers to the Blackoak Rangers. It makes it much clearer that their HQ is Blackoak Castle and it emphasizes that they are an independent organization that is willing to help any Lawful cause that helps bring stability and peace to the region. The other day, I started going through Rob Conley’s Blackmarsh setting (which you can get for free here) to engage in a little creative calisthenics by thinking on how I would run a sandbox campaign using the goodness found therein. While doing this it occurred to me that while Rob has an excellent series on how to create to a sandbox similar to Blackmarsh (a map, encounter areas, major NPC’s etc. ), not everyone (especially me at the moment) has the time or inclination to do all that work. Therefore, I thought it might be interesting to write down my method for prepping a sandbox campaign using a preexistent setting like Blackmarsh, especially since it follows in the footsteps of settings like Judges Guild’s Wilderlands of High Fantasy with what might be called a terse style. I must admit, I am also doing this for the purpose of having a repository for the ideas I have come up with because this is becoming a campaign I wouldn’t mind running someday. I love the concepts of The Mountain that Fell and Viz. They give magic a source — there is this alien substance brought to the world via an asteroid that crashed into the very region the campaign is to take place. In addition, viz is something that can be found, touched, forged, bought and sold. It gives the entire region a gold-rush kind of feel where greed is going to be a major problem. There are a bunch of potential factions competing with each other over resources (like viz) and territory: The Osrobards, Castle Blackmarsh, the Vasan Vikings, the Grand Kingdom, the Blackmarsh Rangers, the House of the Raven, the Greywood Elves and the Bolzak Dwarves of Olden Hold. The Osrobards are trying to become civilized, an endeavor the younger generation seems to take more seriously than their parents. The men of Castle Blackmarsh are remnants of the long-gone Bright Empire. The Vasan Vikings are refugees seeking revenge upon the Grand Kingdom which drove them from their home, but find themselves just trying to survive. The Grand Kingdom, though the current champion of Civilization who is trying to take up the mantle once lost by the Bright Empire, is still just an usurper in Blackmarsh. The House of the Raven are regular elves, not drow. Their motivation is chauvinism, not evil for the sake of evil. In other words, they are the heroes of their own story — the best kind of villain. As normal elves working for the betterment of elven kind, they can also operate secretly (openly?) within Greywood without raising an eyebrow. The Blackmarsh Rangers are recruiting. There is a bunch of undiscovered goodness at the bottom of the Smoking Bay. The Dragonbone Peaks have an extensive cave system formed as a result of the Mountain that Fell. There is an abandoned Dwarven Hold called Daur Anthar guarded by an earth elemental. There is an old wizard’s tower where an experiment went awry. There are a number of dragons, one who has a great name: Scytheback. This dragon is responsible for the destruction of a settlement which served as a hub for silver mines. There is a hydra that the House of the Raven are trying to use to create havoc. There are a number of Stone Giants that mostly leave people alone. Today is the Feast Day of Auxentius of the Mountain. Born in Syria, he enlisted as a soldier in A.D. 442, during the reign of Theodosius the Younger. He served in the Fourth Military Company of the Scholarii, also known as the Imperial Guard. He saw enough vanity in the world of high politics that he retreated into monasticism. He became a hermit on Mt. Oxia (which came to be known as Mt. Auxentius). This mountain was near Chalcedon, a city across the Bosporus from Constantinople, in the Roman Province of Bithynia. As often happens with holy hermits, he began to attract other monastics and he became an Archmandrite (literally, “chief of a sheephold”) of the community there. He was asked to speak at the Fourth Ecumenical Council at Chalcedon in A.D. 451, which dealt with monophysitism (the belief that Christ only had a divine nature). He became well-known as a healer. Chalcedon, Bithynia and Mt. Oxia/Auxentius are all on the northern coast of modern-day Turkey, just east of the Sea of Mamara. Bithynia was actually its own Kingdom prior to voluntarily becoming a part of the Roman Republic. Its capital was Nicomedia, which was on the eastern coast of the Sea of Mamara. I added a stand-in for Nicomedia, which could be the capital of a kingdom whose influence reaches east off the map. In addition, I included a "Mt. Auxia," which could serve as another option for a megadungeon (we could always use another abandoned monastery). Alternatively, there could be an active monastery where PCs might find an oracle, or the guardian of a key piece of information and/or object. Given that St. Auxentius was a healer, PCs might go to the mountain seeking the only person in the region able to heal a particular ailment. This, in turn, might have the PCs going on a mission at the request of the monks on Mt. Auxia. 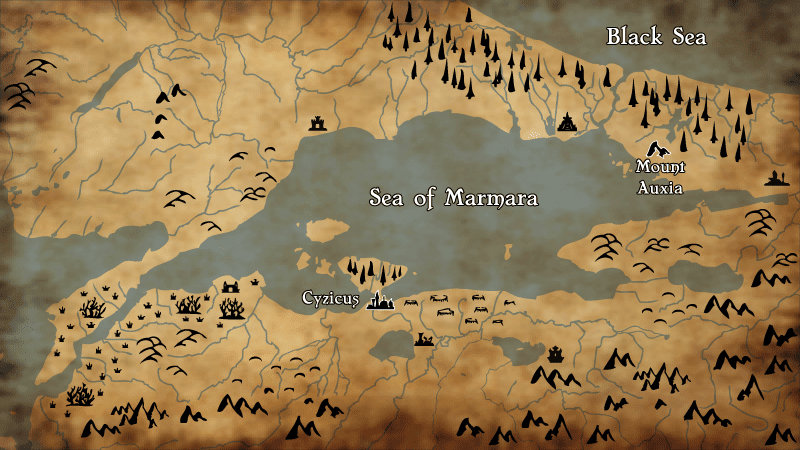 Regardless, this proto-campaign, based around the Sea of Mamara continues to grow. I've observed that a trouble with alignment is that people get confused between its cosmic, political, and character facets. Thus without contradiction a single figure can serve cosmic Law while espousing political Freedom and walking a Neutral path between personal predictability and whimsy. And when the agent of political Law persecutes the agent of cosmic Law there is likewise no contradiction. I feel this deserves an entire post, because I fundamentally disagree that there is no contradiction when a single figure serves the cosmic Law, preaches political freedom and embodies Neutrality personally. Whether we like it or not, Western Culture has Judeo-Christianity as its foundation (despite repeated attempts to abandon it). At its core, Judaism sets forth an ideal that the cosmic, the political and the personal can and should all be united. This ideal is codified in the Mosaic Law. In Christianity, this unity is made manifest in the person of Christ. In both cases, it is the individual’s calling to strive for that unity, either through participation in the Law or in Christ. Thus, what Roger identifies as confusion really isn’t; however, it is an ideal. From the Christian point of view the Mosaic Law has no salvific value. Rather, its purpose is revelation. One of the things it makes perfectly clear is that humanity, on its own, is completely incapable of fulfilling the Law and therefore uniting the cosmic, the political and the personal. In religious lingo, we call this sin. Therefore, one of the realities of the fallen world is that, especially when one talks about politics, contradiction is inevitable. Let me give you an example that has been bandied about recently in U.S. politics — vaccinations. The state government where I live requires by law that all children receive a schedule of vaccinations in order to participate in government funded public education. At odds here are two concepts that most Westerners would find good: Freedom and Security. As a parent I am not free to choose and therefore control the healthcare of my children, even if I have religious, personal or individual health concerns about my kids and vaccinations. On the other hand, I live with relative security that serious contagious diseases in my community are kept to a minimum. If we were free to choose vaccination or no, diseases we thought long ago defeated would have a serious chance of returning to our communities. Even if I choose vaccination, my kids may very well contract these diseases through the children of parents who opt out of vaccinating their children. In the state where I live, some of the mandated vaccinations use fetal matter from abortions. Regardless of which side you are on, your choice leads to suffering and death. The crux of ethics, therefore, is what sacrifice are we personally and/or societally willing to make — who is going to suffer and die for our security and freedom? This question is at the core of Firefly and Serentity. Both the Operative and Mel are right; however, each answer requires a different sacrifice. For those curious, Christ’s answer to that question is Himself. Therefore, it becomes possible for us to overcome the pain and death necessitated by the fallen world and enter into His Kingdom where that unity is made manifest. The alignment system is born of the idealized unity of the cosmic, political and personal in Judeo-Christianity. We run into so many problems with it because what PCs are doing is almost entirely political. Therefore, player action will inevitably create dissonance with their alignments. I would argue that this isn’t a bad thing. Firstly, it duplicates what the Mosaic Law reveals. Secondly, it is fodder for good adventures. It is always interesting to see how people react to situations where two “goods” come into direct conflict. In the end, I am back to my preferred alignment system: Law-Neutral-Chaos. It gives me the freedom to explore this facet of our fallen nature without getting caught up in the minutia of a nine-point axis. When you spend enough time reading the Synaxarion, you run across entries about saints who have no name or saints about which we really only know scant information about and only because they are mentioned in passing by one or more ancient sources. Today is the Feast of St. Augulus and he is one of these saints. We know him primarily because he is listed by St. Jerome as a martyr and a bishop from Britain. Most likely he was martyred in London. Time references (circa A.D. 300) suggest that he was killed during Diocletian’s persecution of Christians. One might speculate as to why his story is not widely known. My own guess has to do with the remoteness of the Roman colony in Britain and the fact that a few centuries later it was overrun by pagan Goths when Rome abandoned their British territory. The fact that we still know of him is rather spectacular. His story, what there is of it, does get me thinking about alignment, of all things. I have done a lot of posts on alignment, and no matter how I might pontificate about the matter, I always fall back on the three-alignment system found in 0e and B/X in actual practice. While I could probably play sans any alignment rules, the Law-Neutrality-Chaos axis does provide for a useful — and very flexible — reference point. This is true not only for players, but for for me as well. life, beauty, truth, freedom and the like are held as valueless, or at least scorned. By adhering to stringent discipline, those of lawful evil alignment hope to impose their yoke upon the world. Those of this alignment view regulation as all-important, taking a middle road betwixt evil and good. Thus, the nine-point alignment system cannot adequately describe the Operative and his philosophy of life. The three-point axis, on the other hand, can. As an agent working to protect Civilization, he is clearly Lawful. In the same way, the soldiers who arrested and murdered St. Augulus during the reign of Diocletian were not agents of Chaos. They, too, could be described with the label Lawful. What kind of Civilization are we making the Wilderness safe for? Due to this rendering, I have always thought of hobgoblins as having an altogether different order of civilization and culture than other goblinoids. Recently, I have been meditating upon the ecology of the hobgoblin and had an epiphany, which I’d rather like to share. First things first, in order to understand some of my basic assumptions about goblinoids in general and hobgoblins in particular, please refer to my previous ramblings on Elves and Dwarves. These assumptions seem to be supported by the MM1 description. Note that, like goblins in Holmes who attack dwarves on sight (thus suggesting their dwarven ancestry), hobgoblins “will attack [elves] in preference to any other troops.” Thus, hobgoblins are twisted elves. The hairy hides of hobgoblins range from reddish-brown to gray black. Their faces are bright red-orange to red. Large males will have blue-red noses. Given these factors, the origin of how elves were twisted into hobgoblins seems to suggest itself — hobgoblins are the product of a breeding program that intermixes elves and carnivorous apes. The majority of hobgoblins seem to continue this rather disturbing process. This explains the necessity to speak the language of carnivorous apes and the close relationship they have with them. It also suggests a reason why hobgoblins prefer to attack elves above all other troops — to capture more elven stock to interbreed with carnivorous apes in hopes of producing stronger strains of hobgoblin. It is even possible to imagine, due to the arcane nature of elves, that such experimentation has resulted in such ape-like monsters as girallons. Considering the fact that the MM1 gives hobgoblins Average intelligence instead of the typical goblinoid Average (low), it is possible to imagine that the entire hobgoblin culture centers around a quest for some kind of eugenic ideal that they are continually refining through their interbreeding with carnivorous apes and the offspring of carnivorous apes and the occasional elven captive. There, I hope that helps folks see that the hobgoblin can be more than merely a bigger goblin. I have a quixotic obsession with Weapon vs. AC Tables. It is quixotic because at its core, D&D combat is extremely abstract. Once one starts to add things to make it more concrete (like a Weapon vs. AC Table), combat becomes complex, game flow slows down and becomes something I would rather not play anymore. When it comes to crunchy systems that simulate one-on-one or skirmish level combat there are far better games than D&D; however, it’s the abstract nature of D&D combat that gives D&D (especially in its older incarnations) much of its charm. There is enough drama involved in the combat system that it is fun to play, but at the same time it is simple enough to get through a single combat quickly so that players can focus on whatever aspect of the game they are interested in, whether that be exploring, interacting with NPCs or hacking through as many monsters over the course of evening as possible. I did, however, play war-games before I played RPGs. Therefore, part of my gamer-make-up likes the kinds of tactical choices one must make while playing a war-game. Thus, I have a deep-seeded desire to bring this kind of choice into the combat system of the RPG I play most often. Inevitably, though, the moment I polish off my latest and greatest Weapon vs. AC Table, reality sets in and I am faced with the fact that once implemented, I don’t want to play anymore. Enter 5e and the Advantage/Disadvantage mechanic. This affords me the opportunity to make a Weapon vs. AC Table as abstract as feasible, thus keeping combat in the abstract rather than the concrete. This holds the possibility of tacking on a tactical choice for players simple enough that combat remains abstract and therefore something I might still want to play. 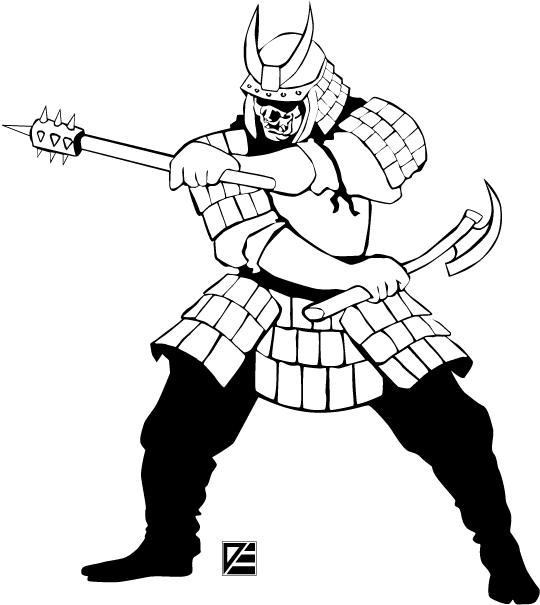 One could also rule that unarmed combat automatically is at a Disadvantage against all armor types (unless one were a specialized class like the monk). This works reasonably well for most monsters. While there are anomalies, these are few and quite easy to adjudicate on the fly. For example, Giant Beetles have a Movement of 120’+. One can simply rule that all giant insects or creatures with exoskeletons have heavy armor. Goblins and halflings have a Movement of 60’ due to their size. It is easy enough to rule that they have Medium or Light armor. Finally, as a general rule, PCs should be at a disadvantage against gigantic creatures like dragons, giants and purple worms regardless of what weapon type they use. This makes combat with such monsters epic in scale, something that I imagine such combats ought to be.